Enjoyed my evening at the catalog premier. 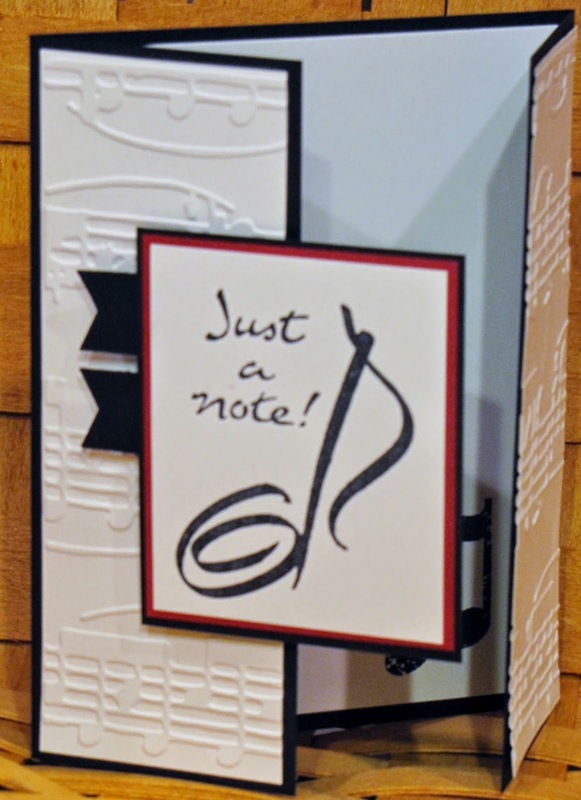 Lots of great new stamp sets and accessories, rich in-colors and a great catalog layout. Got to meet Lisa Pretto from Madison, she is a SU! upline of mine; that was a treat. Came home with my catalog and a brand new stamp set that I know I will love. It was a great night, but I'm beat and heading off to bed, but before I go, here's a thank you note I made for a friend and band teacher who spent an hour and a half on Saturday afternoon at a music store helping my son find his "mouthpiece soul mate" for his tenor sax. It was quite the educational experience for both of us. The stamp I used is retired, but due to my music background, it's one I hang on to. You'll be seeing new products soon, so stay tuned!